Buy the guidebook until Christmas 2018 and get free UK postage. Give the gift of paddling to all your friends and family and buy them a guidebook each. Remember buying direct from this website means you give an extra tenner per copy to the Access Fund charity compared to larger retail websites. Improve the rivers you paddle on and make a donation to the Access Fund when you buy the book. Current open projects include rebuilding the steps on the Blackwater, bank stabalisation on the Spey and developing the Fort William Tailrace. Make a Christmas Donation to the Access Fund charity. In this guidebook you will find descriptions of both well-known classics and little-known gems. It covers the length and breadth of the country and provides something for everyone, whatever the conditions, whether you are an aspiring rapid paddler or an out and out hair boater. 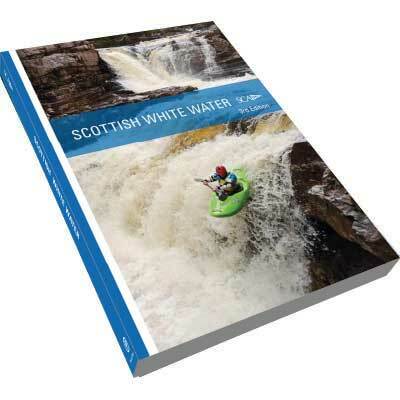 With maps, pictures and first hand accounts, here is a guide that captures the spirit of Scottish white water. 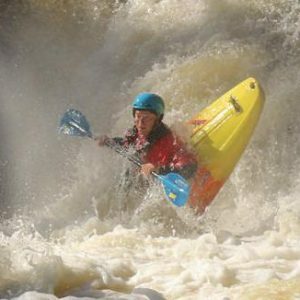 This is a white water guide and runs are mainly grade 3 and above, although a few classic grade 1-3 sections are included. The guide has been written and edited by an army of volunteers from the Scottish white water community. Every penny raised will go into the Andy Jackson Fund for Access, and will be used to fund practical projects which enhance access to the rivers we all play on and enjoy. Buying direct at Wet West Paddlefest, or from the AJ Fund website cuts out the wholesalers’ costs and means that your money goes to the fund. New to this edition by popular demand are river maps to some of the most popular runs; improved location maps, full lat/long coordinates for your sat nav as well as grid references; three brand new sections (Shetland, Harris/Lewis, and Glen Carron to Glen Shiel), notes on other island rivers, and descriptions of 86 new runs.